Long before Culver City became a happening culinary Mecca, dotted with chic brasseries and wine bars, it belonged to humble eateries like Tokyo 7-7. 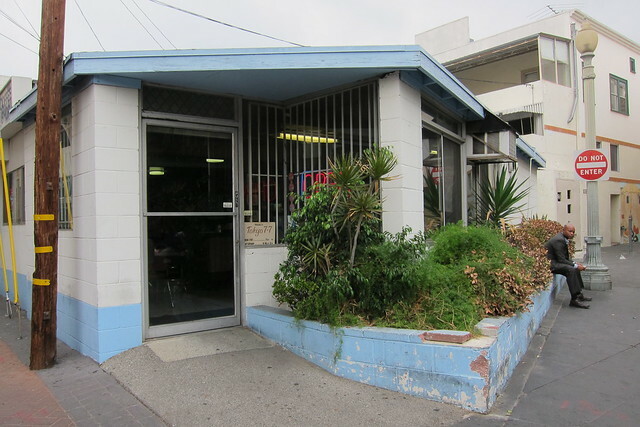 Tucked in an alley off Washington Blvd., this Japanese-American diner sits in the shadows, literally and metaphorically, of half-a-dozen hip, upscale restaurants. Tokyo 7-7 Coffee Shop is neither of those things. Tokyo 7-7 isn't a simulacrum of an old-school diner, complete with surly artistes manning the register and bland, overpriced food (can you guess which downtown haunt I'm thinking of?). 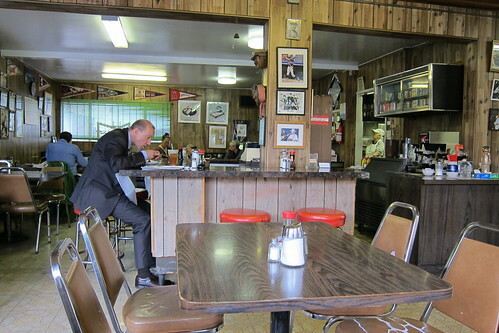 Tokyo 7-7 actually IS an old-school diner. In fact, Tokyo 7-7 is so old-school, it's celebrating its 27th anniversary this December -- and it's doing so despite many of restaurant row's more recent patrons never noticing the place. In all fairness, Tokyo 7-7 isn't easy to find. It's in a small, hard-to-find shack and never stays open past 3 p.m. 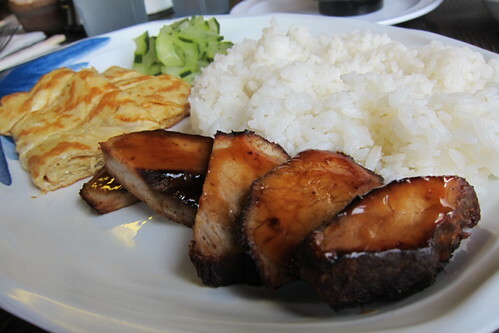 This is a bona fide hole-in-the-wall with maybe a dozen tables and a shockingly cheap menu that mixes classic, American diner fare like eggs, pancakes, burgers and sandwiches, with Japanese and Hawaiian dishes like gyoza, yakisoba and udon. You can get your eggs with rice. You can get your chili with rice. Hell, you can probably get your milkshake with a side of rice and the waitresses won't bat an eye. For breakfast, try one of their Royals a.k.a. 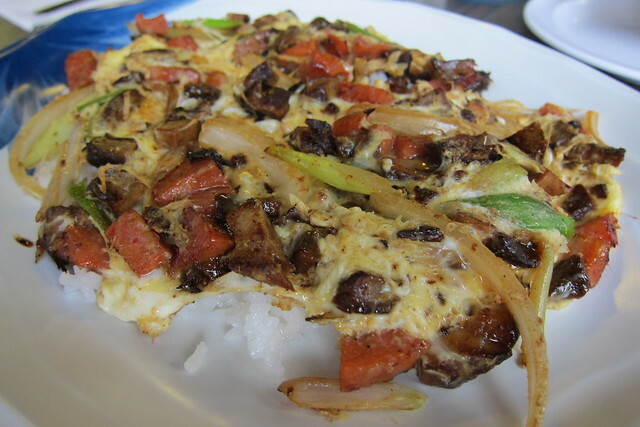 "open-faced omelets" a.k.a egg scrambles ($4.40-6) made with green and white onions and your choice of hamburger, chicken, house-made cha-shu or Portuguese sausage and served on top of a bed of rice. Can't decide? The Hawaiian Royal includes both cha-shu and Portuguese sausage. For lunch, the 7-7 Special is the classic deal. 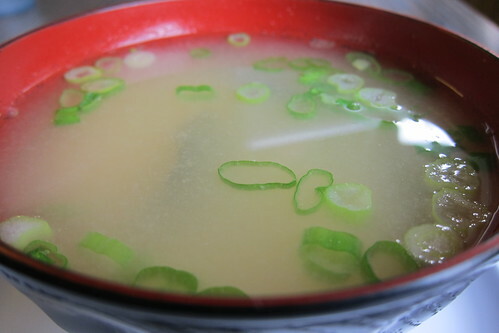 For only $6.70, you get a bowl of hot miso soup, a generous helping of sweet, crisp tsunemono (pickled cucumbers), rice, cha-shu drizzled in a sweet/salty sauce and tamagoyaki, a thin, lightly sweet omelet folded in gentle layers. One more thing: bring cash. In true greasy spoon fashion, that's all they take. Tokyo 7-7 Coffee Shop: 3839 B Main St., Culver City. Mon. - Fri. 7 a.m. - 2:45 p.m.; Sat. 8:30 a.m. - 2 p.m.; Closed, Sun.